This query, while understandable, has always frustrated me. The variety of Minor League Baseball ballparks is indicative of the variety of the American landscape. How can one reasonably compare a shining downtown shrine in a large Triple-A market with a historic Rookie-level facility located in a small town and overseen by a full-time staff of one? And what criteria go into determining a "favorite," anyway? Factors include but are not limited to architecture, the appeal of the surrounding area, the experience provided by the front office staff, culinary options and the fervor of the fan base. And, even after all that, it's still just a matter of taste. In order to answer this long-vexing question while mitigating some of the discrepancies detailed above, I have decided to list my favorite ballparks by level of play. It was still a thankless task, full of both metaphorical and actual teeth-gnashing and hair-pulling, exacerbated by the knowledge that my choices -- and, by extension, anyone's choices -- are sure to result in reactions of incredulous disdain from those who disagree. By and large, I'm a fan of the classics. I didn't quite realize how much so until I was putting this article together. But I'm looking forward to teams and fans telling me why my choices are not, in fact, correct. That's what makes this fun. 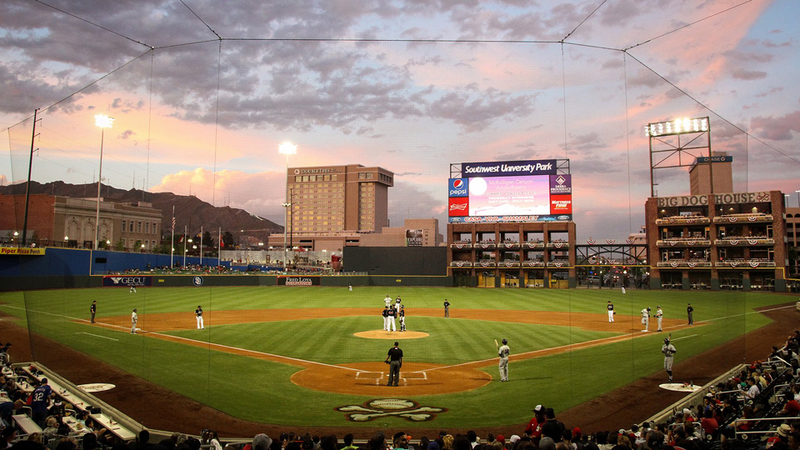 El Paso is a border town, and Southwest University Park encapsulates the blend of Mexican and American culture that typifies life in the West Texas city. The Chihuahuas name is a reference not just to the small dog, but to the Chihuahuan Desert that encompasses both West Texas and a substantial part of Northern Mexico. The Franklin Mountains loom beyond the park's left field fence, the El Paso skyline is visible to the right and the sprawling, mountainous Juarez, Mexico, cityscape hovers just beyond the home plate side of the stadium. Interesting architectural components -- such as the three-story "Big Dog House" in right field -- make the park itself a memorable place to explore, and the multicultural fan base provides a livelier-than-usual Minor League game day atmosphere. As if all this wasn't enough, you're unlikely to find a wider array of authentic Mexican cuisine at any American sports facility, anywhere. Sixty-seven-year-old First Energy Stadium is perhaps the premier example of a "best of both worlds" Minor League atmosphere, in which an old ballpark retains its throwback charm while offering a modern entertainment experience. Reading has been a Philadelphia affiliate since 1967, and the long history and convenient proximity between the two organizations results in a fan base that is both passionate and knowledgeable. The same goes for the front office staff, which has featured far less turnover than is typical in the industry. A night at First Energy Stadium is imbued with the past, but, somewhat paradoxically, not weighed down by the no-distractions dogma of the baseball purist. This is a ballpark rife with color and characters, set against a bucolic Berks County backdrop. Presiding over it all is the ostrich-riding Crazy Hot Dog Vendor, a bespectacled local hero whose antics are complemented by a literal band of mascots; they occasionally bang out classic rock 'n' roll covers from a stage located on the first base side of the ballpark. A Fightin Phils game is equal parts sporting event and county fair, a sensory overload mash-up of the traditional and idiosyncratic that, somehow, all seems to make sense. Welcome to Baseballtown. Most Florida State League ballparks aren't exactly Minor League ballparks, per se, but Spring Training facilities occupied by Minor League teams after their parent clubs depart in March. Daytona Beach's Jackie Robinson Ballpark is the circuit's most notable exception, as it is a classic facility, located on an actual island, with charm and style to spare. The majority of fans sit in a covered grandstand under a rooftop press box, with views of Broadway Bridge spanning the Halifax River. The lively concourse, abutted by lime green exterior walls, includes the Bob Ross "Happy Little Tree" (planted in honor of the Daytona Beach native) as well as an interactive museum devoted to the life and times of stadium namesake Jackie Robinson. The baseball trailblazer spent the 1946 Spring Training in Daytona Beach as the city ignored Jim Crow segregation laws to let him play his first games as a member of the Brooklyn Dodgers organization. The ballpark was renamed in his honor in 1990; that same year, a Jackie Robinson statue was erected outside of the ballpark. In 1926, after an exhibition game at McCormick Field, Babe Ruth had this to say: "My, my, what a beautiful place to play. Delightful. Damned delightful place." Over 90 years later, the Bambino's sentiment still applies. Nestled into a hilly landscape south of downtown Asheville, McCormick Field is an anachronistic charmer. Ruth is not the only legendary slugger who played there; in "Bull Durham," Crash Davis broke the Minor League home run record as a member of the Tourists and scenes from the movie were filmed at McCormick Field. The concourse, bursting with cartoonishly decorated concession stands, exudes the sort of funky charm that Asheville has become known for. Crowds are liable to be the biggest for "Thirsty Thursday," a promotional idea that was first conceived (and later copyrighted by) the Tourists. It's a fitting claim to fame for a team that plays in a region where local breweries abound to the extent that the club occasionally changes its name to the "Beer City Tourists." There are 160 Minor League teams playing in 159 different ballparks (the Palm Beach Cardinals and Jupiter Hammerheads share Roger Dean Chevrolet Stadium). But there's only one ballpark that an American citizen needs a passport to get to, and that is Vancouver's Nat Bailey Stadium. This 67-year-old facility hosted Triple-A Pacific Coast League baseball through 1999, shifting to the short-season Northwest League in 2000. The Canadians' mid-June through early September schedule meshes perfectly with Vancouver's climate, avoiding harsh early spring weather in favor of idyllic summertime days and nights. It all plays out in a classic baseball atmosphere that combines natural beauty with the multicultural vibrancy of one of Canada's most livable cities. Grab some sushi and an Asahi and enjoy the game. The original Bowen Field was destroyed by fire in 1973, so most of the ballpark that's in place now dates back only to 1975. Nonetheless, there's a timeless quality to this facility, a simple structure consisting mainly of a covered grandstand. Such a no-frills aesthetic is common in Rookie-ball, but Bowen Field's gorgeous background makes it stand out. A lush, gently sloping expanse of trees rises behind the outfield, the green of the foliage complementing the natural grass of the playing surface. It's a perfect home for birds; the team was an affiliate of the Orioles from 1958-2010 before switching to the Blue Jays.